Geeks on Tour Blog: Vamos a Mexico! 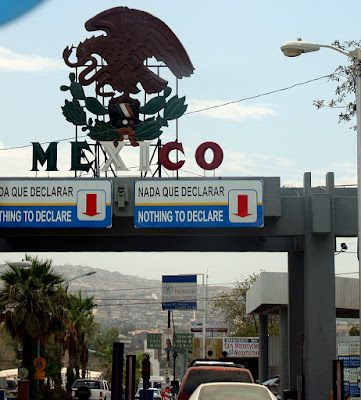 I knew we were very close to the Mexico border here, but I didn't know there was anything for us to do there until I got an email from one of our newsletter subscribers, Diane. 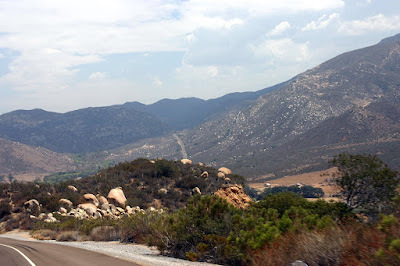 She wrote that they had stayed at Pio Pico in the past and enjoyed visiting the border town of Tecate and touring the brewery. I looked on Google Earth and found that Tecate is only 18 miles away, and the brewery is just on the Mexico side. We had no seminars scheduled today, so, Mexico here we come! Thanx for the tip Diane. It was a pretty drive to get there too. Very mountainous. We saw some cars being searched at the border crossing. We pulled into the designated parking spot and the officer asked us what our plans were. Jim said we were going to the 'cervezeria' (beer garden) and he just waved us right through - looking very thirsty and envious! It was an especially hot day today. 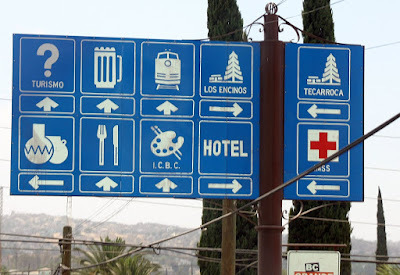 The cervezeria was easy to find with these street signs ... check out the first row, second sign from the left ... 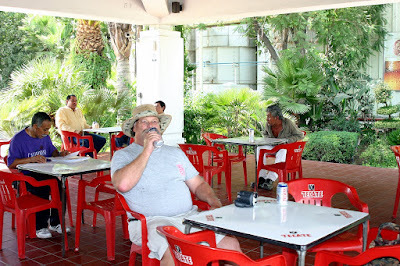 Unfortunately, they were closed for tours today, but the free, cold beer tasted good in the 'Jardin Cerveza'. Then, we walked around a few blocks to find a place for lunch. We were surprised to find that we were about the only tourists. 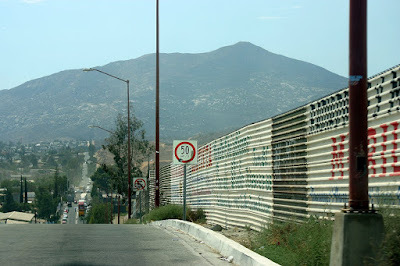 The last time we visited a Mexico border town (Algodones) there were crowds of tourists. In Tecate, we actually had to remember a little spanish. They still accepted american dollars though! The exchange rate was 10 pesos to 1 dollar. We had an excellent lunch, and even had live entertainment! 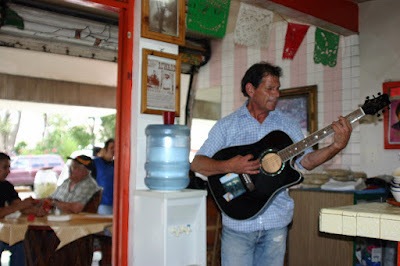 He might look like he's singing Cielito Lindo, or some other traditional mexican song, but - no - he sang 'Imagine' by John Lennon and 'Stairway to Heaven' by Led Zeppelin! Then we walked around the town square. 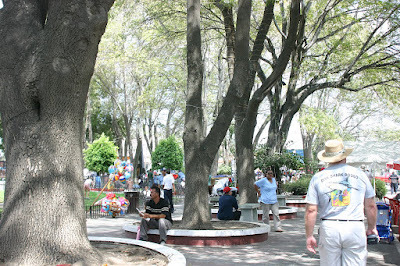 I really like how town squares are really used in Mexico. 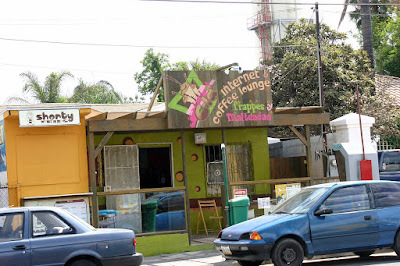 We saw at least 3 Internet cafes. That was it, then we went home. Here's the fence on the border here. 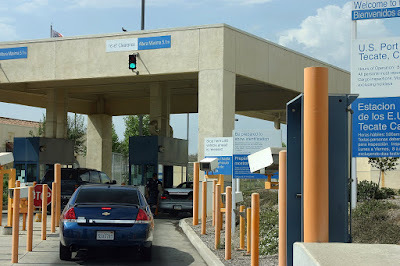 Crossing the border back into the US was just as easy as getting in. They took a look at our Florida license plate, the kayaks on the roof and our US passports and waved us through. One of these days we'd like to take the motorhome into Mexico and do some exploring. We have the book on RVing in Mexico by Mike and Terri Church with all sorts of information about where to go and what services to expect. Check out their website with logs of their most recent Mexico travels. Buenos Noches! 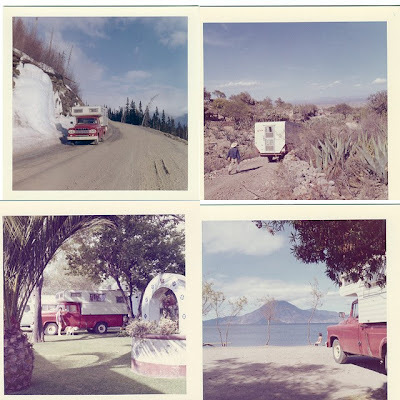 My very first RV trip was in 1962 when my parents packed up their truck camper and left our Anchorage, Alaska home to travel to Guatemala. I took plenty of spanish classes in high school but I think any words I still know are from that 4 month trip when I was 10. Here's a few photos that have survived and been scanned. The first one is on the Alaska highway in January. The next is driving in Mexico - I believe around Queretero. The third is a campground in Mexico city and the last is on the shores of Lake Atitlan in Guatemala. 200 miles in 6 1/2 hours? !